By the numbers, Pittsburgh’s Liberty Avenue is a walking and transit street. During the busiest times of day, 6,000 bus riders and 2,000 pedestrians travel the corridor per hour, compared to 1,200 drivers. But until last month, you’d never guess from looking at the physical design of Liberty Avenue that transit riders and pedestrians are so numerous. The vast majority of its 50-foot width was dedicated to general travel lanes, so a relatively small number of motorists were slowing down the far larger number of transit riders. Now Pittsburgh residents are getting a taste of how Liberty Avenue can work when it’s designed to prioritize transit riders. For the next 18 months, the city is testing out a red bus lane and raised bus bulbs on a two-block stretch of the road. Pittsburgh has long operated a system of exclusive transitways where only buses are allowed. But once those busways get to downtown streets, the transit priority disappears and bus riders are mired in traffic. There are just a few downtown bus lanes. Only one side of Liberty has the bus lane. On the other side, Envision Downtown is experimenting with raised bus bulbs using inexpensive sidewalk extenders made out of modular, hard rubber components that snap into place. The bus bulbs speed up boarding since bus drivers don’t have to pull in and out of traffic, and free up some room on the sidewalks. The whole demo cost $50,000. A later phase of the demo will add corner sidewalk extensions using paint and planters. “We’re really working to shrink the crossing distance for pedestrians, which is 50 feet across,” said Luther. 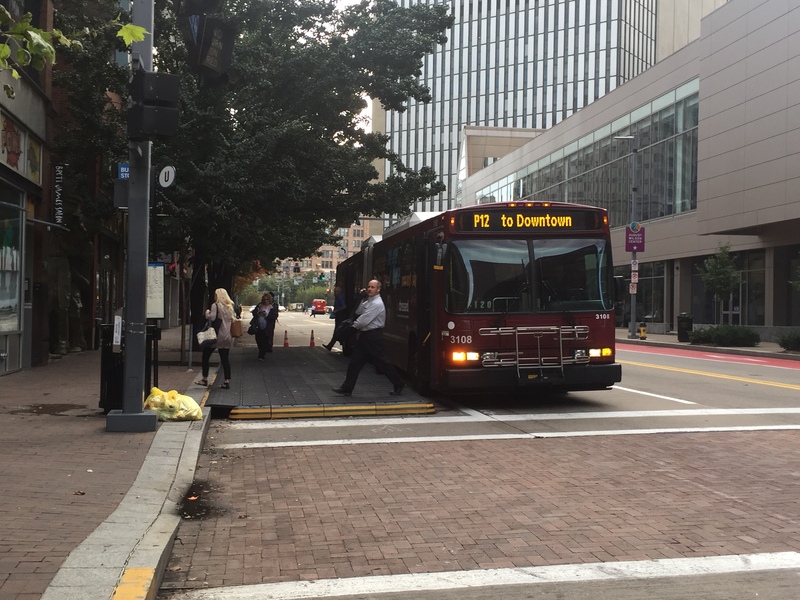 Downtown Pittsburgh’s streets are narrower than in many other mid-sized cities, which makes building public support for bus lanes more difficult, said Luther. The downtown bus lane network has shrunk over the years, a trend he hopes the pilot will help reverse. After the 18-month demo, Envision Downtown will publish an evaluation and recommend whether to extend or remove the bus lane. I’d much rather see these I need yellow. First, Red tends to disappear at night – part of the reason emergency vehicles changed their color to yellow or white. Second, it reminds me of someone hitting a deer and dragging it down the road. I was just talking to someone on Carson street about Pittsburgh’s backward public transportation when the incline car came down the track and had to laugh because that’s where our mass transit is stuck, in 1917. What about an elevated electric lightrail system as was proposed in the 70s(skybus), all the way through the suburbs that could get you to work in 10 minutes? Or a hyperloop? You can ride the SkyBus’ descendant at PIT. In a recent editorial, the Cleveland Plain Dealer argued that "wheezing, block-long buses" should get booted off the city's main square, disrupting tens of thousands of transit trips. But rerouting the buses is going to make emissions worse, not better. American cities are discovering a way to quickly improve bus boarding using modular plastic pads.